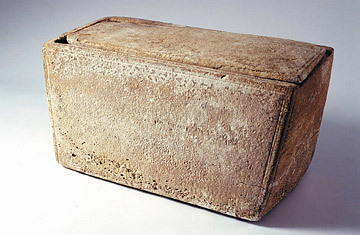 The world of biblical archaeology was stirred in 2002 by the unveiling of a limestone burial box with the Aramaic inscription Yaakov bar Yosef akhui di Yeshua ("James, son of Joseph, brother of Jesus"). Allegedly dating to an era contemporaneous with Christ, the names were a tantalizing collation of potentially great significance: James was indeed the name of a New Testament personage known as the brother of Jesus, both ostensibly the sons of Joseph the carpenter, husband of Mary. If its dates were genuine, the burial box  or ossuary  could well be circumstantial evidence for the existence of Jesus of Nazareth, a tenet supported only by gospels and scripture written, at the earliest, a generation after his crucifixion and, of course, by the faith of hundreds of millions through 2,000 years. Next week, defense attorneys will take on one technical aspect, presenting evidence suggesting that scientists testifying for the prosecution have disproved their own findings against the ossuary. The scientific evidence against Golan is largely based on measurements of the oxygen isotopic composition (in technical terms, d18O  Delta 18 Oxygen) of the thin crust  or patina  covering the ossuary inscription. Bar-Matthews and Ayalon based on their research on stalagmites in a cave near Jerusalem, where isotopic data showed rainfall and surface temperatures over many centuries, they concluded that the climate in the past 2,000 years could not have produced the patina on the ossuary. As they wrote with Professor Yuval Goren  another prosecution witness and professor of archaeology at Tel Aviv University  in the Journal of Archeological Science in 2004, "the patina covering the letters was artificially prepared, most probably with hot water, and deposited onto the underlying letters." The article states: "There is no evidence for the existence of water with such low d18O values in the area during this time span. The range of rain and groundwater d18O values in the Judean Mountains region during the last 3,000 years could not have been lower than approx -6 permil." Pressed by defense counsel, Bar-Matthews declared that an isotopic value lower than -6.5 permil for the ossuary was "impossible." The defense expects to use these esoteric contradictions against the prosecution when the trial resumes on Sunday. Defense expert Prof Joel Kronfeld of the Department of Geophysics at Tel Aviv University says the new data shatters the prosecution case. "I think this is amazing  it blows my mind," Kronfeld told TIME. "The findings in this study stand in complete contradiction to the assumptions presented by Ayalon and Bar-Matthews, and shed new light on the theory they presented to the court. They not only undercut their own arguments for determining that the patina on several items was not natural but rather quite the opposite. These data can support the authenticity of the items." The defense is likely to point out that the tests on the ossuary carried out by Bar-Matthews and Ayalon also found traces of patina in at least two other letters of the inscription with isotopes of -4.65 and -5.82 permil  well within the original range they suggested. Bar-Matthews and Ayalon discounted these results, saying the results had been corrupted either from the limestone of the box or from a nearby crack that had been recently repaired. The trouble with this kind evidence is, of course, that the formation of patina isn't yet explainable in science everyone can agree on. The patina on one letter could be the result of one particularly wet winter that happened to leave its evidence on the ossuary  but perhaps not in a stalagmite in a cave. Or vice versa. "The analogy between the formation of cave deposits and the formation of patina on archeological objects is imprecise and more work is needed," says Professor Aldo Shemesh, an isotope expert at the Weizmann Institute who was also called as a defense expert. In the end, using this kind of evicence is a numbers game  figuring on averages of statistics over which all the experts disagree. Says Shemesh: "Scientific debates should be discussed and resolved in peer-reviewed literature and scientific conferences, not in court."